What do traditional devices like TVs, PCs and DVDs have in common with in-demand Bluetooth gadgetry? Both can connect to the sound bar for unparalleled convenience and usability. The sound bar allows wired connections included LINE IN/AUX, so practically every device can connect; while your favorite smartphones, tablets, and other Bluetooth devices have the option to connect wirelessly. 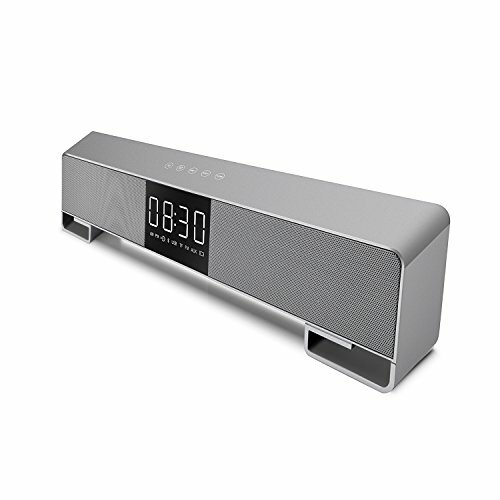 On the top of the sound bar is a high grade metal control unit that responds to the slightest touch allowing you to adjust the volume, select tracks, or play and pause music or set an alarm clock, or hands-free / answer phone.It is convenient for you to operate easily. As versatile as it powerful, the ALIZOM sound bar can be placed directly under your TV/television or on the computer desktop .No matter how you choose to place it, rich clear sound will reach all around the room. A sound bar adds a modern and exciting touch to any home, elevating your standard living room into a personal theatre system so you can feel the bass / stereo music. Fashion design, the sound bar uses tough ABS plastic and Metal gauze ensuring you'll have great sound for years to come. If you have any questions about this product by ALIZOM, contact us by completing and submitting the form below. If you are looking for a specif part number, please include it with your message.